Marrok had just caught a third hare when he was about to catch his fourth a brown pup alerted it and made it hop away down into its tunnel. 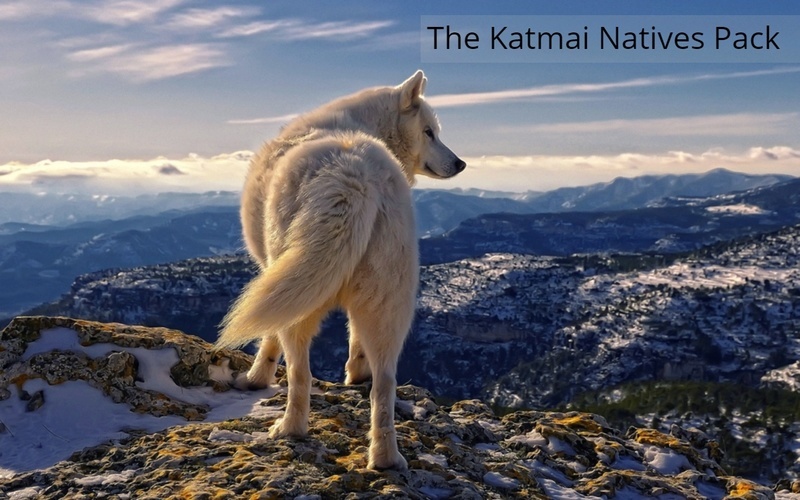 Rising up from his crouch the massive brute of white fur and red markings glared at the pup, then his gaze cooled. He knew the pup did not mean to alert his prey with her hoping around chasing a yellow butterfly. 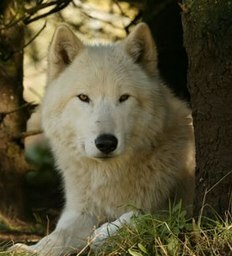 Flicking his ear and raising his muzzle as his yellow eyes looked down at the pup, his tail flickered. "What are you doing here?" He asked the pup in a calm tone, as he had not seen the brown pup around here. Nudging a hare toward the pup guessing she may had been hungry, he then picked up his catch of two since he had given the third to the pup. Amethyst stared into the distance with her gold eyes as she slowly walked out of the den. She wanted to converse with other wolves. She sat down and let a soft breeze blow through her ears. She looked around the den to see another wolf (Win) walking around. She went up to him. "Hello there". She had a smile on her face. She looked at her stomach again and saw that it was moving a little. The pup inside her was awake. She giggled. But after a while she felt a little bit of pain. She squinted her eyes at that feeling and groaned. She layed down looking at Win. She managed another smile. Amethyst glanced towards Winstone. Her gold eyes sparkled as she looked into her eyes. "I'm fine. I bet you are doing good too". She nudged forward towards the female. She waited for a reply from her. As Arrow got up he thought he could go try hunting even if he was blind. He walked over to his mate and asked her if she would help with his hunting. He sat and awaited for a reply from her. Amethyst looked over at Arrow and smiled when he walked over to her. She licked him on the side of his face. "Sure, Arrow. Anything". She slowly got up but limped a little because her paws had fallen asleep when she was laying down. She must have sat on them. She walked to the hunting grounds as the asleep feeling in her paws began to vanish. She looked to see if her mate was trailing behind. She smiled again. shunook started getting board of just laying around the den so she got up and started off to watch over the others making sure nothing was intruding the packs territory full of joy shunook troted around the edges of den area shunook gave a yawn annoyed at how she had nothing better to do, as Shunook troted along she saw a small lemmling running about,shunook built up her strength and leaped right on top of it, killing it she started to eat the lemmling then started off again bored shunook gives an annoyed grunt as she patrold the land making sure nothing was coming in to hurt her fellow pack members. Shunook wrote: shunook started getting board of just laying around the den so she got up and started off to watch over the others making sure nothing was intruding the packs territory full of joy shunook troted around the edges of den area shunook gave a yawn annoyed at how she had nothing better to do, as Shunook troted along she saw a small lemmling running about,shunook built up her strength and leaped right on top of it, killing it she started to eat the lemmling then started off again bored shunook gives an annoyed grunt as she patrold the land making sure nothing was coming in to hurt her fellow pack members. Please have at least three sentences per RP post. Shunook yawned then look at the young female (aka rose) next to her and said" i am shunook its nice to meet you rose" she quickend her pace a bit for she say a hawk up ahead. she gave a loud and ferce growl as it flew out of the territory. she looked back at the young female with her agate gray eyes they shimmered and she asked the rose" what are you doing out here following me when your so young? rose thought for a moment and then said" i want to be a pranice so i thought why not follow a pranice." rose troted side by side with shunook her eyes gleaming in wonder. she tryed her best to keep her pace the same as shunooks but she was much faster than her. so when she picked up her pace to scare off a hawk she fell behind a bit till shunooks pace slowed again. she looked up at shunook in wonder she tryed to hold her head high like shunook but its harder then it looks so she keept her head low like normal feeling a light breeze on her pelt she smiled at the sunlight and looked at shunook and said" i think your nice. can you take me out each day to patrol the territory with you?" rose looked straight into shunooks agate gray eyes and troted along waiting for a reply. shunook looked at the pup suprized at her question but she yawned and said" why not i got nothing better to do." and she started to walk back to the den as soon as she was back she look at rose and gave her a sly smile and said "see you tomorrow morning bright and early. "she went inside the den the young female still following she laid down and fell asleep. Shunook wrote: shunook looked at the pup suprized at her question but she yawned and said" why not i got nothing better to do." and she started to walk back to the den as soon as she was back she look at rose and gave her a sly smile and said "see you tomorrow morning bright and early. "she went inside the den the young female still following she laid down and fell asleep. Rad walks through the never ending snow, not knowing what to do. She had no idea if she was around other wolves since her nose was freezing from the cold. she sighs and lays down next to a lone tree. she glances at the sky, it was partly cloudy, meaning it can snow later on. she looks around her, wondering what wonders can be discovered next. she rests her head on her paws and close her eyes, taking a break from walking. Amethyst layed down in front of the den, looking at her mate for a reply about helping him hunt. Although she wasn't at the rank for skilled hunters like Jeagers, she still liked to help. But, over in the distance, she saw a wolf figure that looked like Rad. She was one of her friends that she met a very long while ago. Her gold eyes sparkled as she looked into the distance a little more, the bright sun gleaming on them. She lay her head on the hard ground and gave a deep sigh. The little pup inside her was awake again and she could feel it kicking around. She then got up and walked into the den, only stoping near the entrance. She lay on her back and relaxed for a while. Closing her eyes, she could hear the faint conversations going on between some wolves. She couldn't help but twist her right ear towards the conversing distant wolves. They sounded happy. For a while did Amethyst fall asleep. Only a light one, then awoke with a start from something that caught her eye for a minute. Rad gets up with a grunt and she continues walking, feeling lonely with nothing around her. her tail trails limply behind her, brushing against the snow. her ears flickers to the sound of the wind and the faint barks of wolves talking. she starts to day dream about her past, and why she cant remember it. the wind suddenly gets stronger and her fur is blown back. she stops and glances up, wondering whats happening. her eyes widen in shock when she looks below her, she had almost walked straight off a high cliff. she shivers, thinking of what could of happened if she just walked right off. she sits down on the edge, her tail flicking causally. A few minutes later, Amethyst walked out of the den, feeling very refreshed. She had taken her nap and her mind filled with happy thoughts. She walked around for a bit. Walking a little further away from the den, she sees that same wolf figure (Rad), only its sitting on the edge of a cliff. She gasps and worries a little. She walks up to her friend near the cliff. "What are you doing near the cliff? You look like you would like some company". She carefully sat down near the female and waited for a reply. Dark reached the den with the carcass, he smiled, he had always loved hunting. He dragged the carcass over to the center of the area and took his piece before moving away a little and laying down. Dark slowly began to eat his piece, realizing how hungry he was. 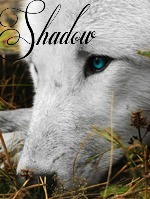 Lightly kicking the snowy colored fae off, Shadow rolled swiftly onto her paws and shook out her ivory pelt. The rich delightful scent of freshly killed prey drifted toward the femmora on the breeze, her stomach growled in response urging the ghostly wolf to investigate. Lifting her paw off the ground, the fae lightly batted at Ihana's muzzle before departing after the aroma. Trotting toward the den site, the fae's pace slowed as she drew closer and her tongue ran along her gleaming incisors. Edging closer to the abandoned carcass, the fae noticed a dark figure (Dark) lying near by already tearing into his share. Having never seen this wolf before, Shadow's glacial optics surveyed the brute, eyeing the scars and the way he isolated himself the fae guessed he was built for battle and most likely took up the Pranice rank. Tearing her gaze away, the fae tore off a smaller portion of the carcass and began dragging it up the steep slope of the hill overlooking the den site. Settling at the rise, the ivory pelted fae collapsed and placed her pale paw upon the meat in a possessive manner before sinking her incisors and thrashing her head to rip apart smaller pieces. Rad jumps up, spooked by amethyst sudden appearance. she stumbles backward a bit, seeing rocks fall down the cliff. "uh... thinking" she mumbles, still a little spooked by amethyst appearance. "what are you doing here in the first place?" Rad asks, moving back to her spot next to amethyst. a yellow-orange wolf appears from behind a rock. "hi Amethyst!" she said, trotting to her. at arrival, she nods a greeting to the other wolf. she sits looking at them. Amethyst looks at Rad for a moment. "You looked all by yourself. So I decided to see what was going on there". She gave a smile towards her. A minute later she hears the voice of another wolf. She must have met this wolf before. Her muzzle gets the scent of the wolf. She starts to recognize it. "Swift? Is that you?" She says with surprise. Her tail wags fast as she gets excited. "It's so nice to see you again!" Rad glares at the other wolf (swift) unhappy about it. she manages to put on a smile nether less and she backs away from the two, happy to be out of the way. she stares over the cliff face, admiring its beauty. she cant help but to ears drop on them, curious of this new wolf. Snapping up the final remains of her meal, the ivory femmora slowly chewed the meat, savoring the rich flavor before it vanished. Vigorously cleaning her crimson stained muzzle, the fae slowly sat back on her hunches and observed the wolves below. Curling her banner firmly around her paws, the fae sat silently with her ears perked listening to the murmuring below searching for a familiar figure or voice.